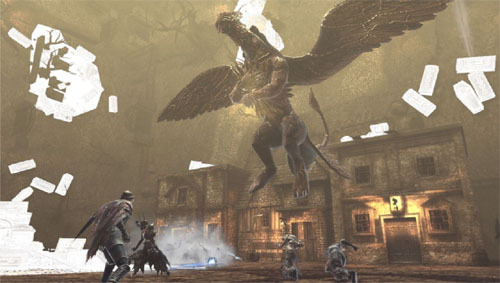 Soul Sacrifice is often compared to the Monster Hunter games for its party-based, monster-killing gameplay. Unsurprisingly, there are some big differences, and with its unique save-or-sacrifice mechanic as well as both online and Ad Hoc co-op, some questions about the co-op are sure to arise. We try to answer some of the FAQs in our Soul Sacrifice Co-Op FAQ. How many players can play Soul Sacrifice via system AD-HOC wireless? How many players can play Soul Sacrifice online? How do you begin a co-op session in Soul Sacrifice? How do I join a co-op game in Soul Sacrifice? Can I play with my friends who are higher/lower level than me in Soul Sacrifice? What does the Soul Sacrifice season pass get you? Is there a co-op-only campaign? Does progress from the co-op pacts carry over into your single-player experience in Soul Sacrifice? How does saving/sacrificing enemies work in co-op for Soul Sacrifice? How does saving/sacrificing players work in co-op? What happens when players disagree about saving or sacrificing a boss in Soul Sacrifice? Up to four players can join a lobby together to play Soul Sacrifice online. You will first need to complete the first six missions of the single-player campaign. This unlocks the \"Network\" menu. Once you have it unlocked, you can navigate to it in the menu by going to Librom -> Network -> Multiplayer -> Play Online OR Ad Hoc play. From here you can create lobby for a co-op game. You will need a Soul Sacrifice online pass to connect to the Soul Sacrifice online servers. This online pass comes with all new games. You can also purchase the pass in the PS Store in the case of used games. Navigate to the same area as above. Instead of create a room, you can search for a room or Quick Join a game. Yes. The lobby leader picks a \"pact\" (a map/mission) for the group, and there are no level requirements for the pacts as far as I’ve seen. In addition, you don’t have to start a pact with a full party either. There is no season pass but an online pass allows you to play co-op. This is included with all new copies of the game or it can be purchased separately if you buy used. No. The pacts can be played in co-op with players or single-player with henchmen. Yes. All Divine/Dark levels and rewarded offerings carry over into your single-player game. In addition, all completion progress of pacts carries over into your single-player game as well. Only one player can sacrifice or save any of the smaller enemies for a health or magic boost as well as essence gain. All living players can choose to save or sacrifice a boss for their own type of essence gain. The end result of the save or sacrifice of a boss will reward you with the corresponding essence, no matter which you personally decided. For this reason, if your Dark/Divine levels are important to you, you might want to roll with like-minded players, or players will are willing to communicate about save/sacrifice decisions. When a player gets incapacitated, he or she will be able ask their party to save or sacrifice him/her. This is only a request, however. Living party members can choose either one. Saving allies causing the savior to lose a large chunk of health as a cost for saving them. Sacrificing them kills the downed players, destroying their bodies for the rest of the pact and unleashing a powerful spell. The dead player can still influence the current battle (provided the massive spell didn’t finish off the boss) by buffing allies or debuffing enemies through touch commands on the touch screen. When a pact is completed, any sacrificed players (as well as the people who sacrificed them) will receive special “martyr” rewards as bonuses for their sacrifice. They will not be able to partake in any additional essence rewards. The host gets the final say. In a co-op game that I hosted, I tested this with one other person in my game. He chose to sacrifice the boss, while I chose to save it. I made sure that he started to attempt to sacrifice before I attempted to save, and the boss ended up being saved. Page created in 0.3873 seconds.